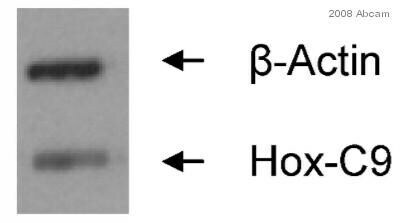 This antibody reacts with HOXC9. 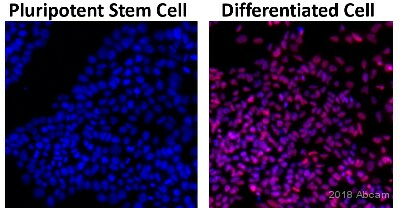 purified from culture supernatant of hybridoma cultured in a medium containing bovine IgG-depleted (~95%) fetal bovine serum, filtered through a 0.22µm membrane. Our Abpromise guarantee covers the use of ab50839 in the following tested applications. WB 1/100. Detects a band of approximately 29 kDa (predicted molecular weight: 29 kDa). Belongs to the Abd-B homeobox family. 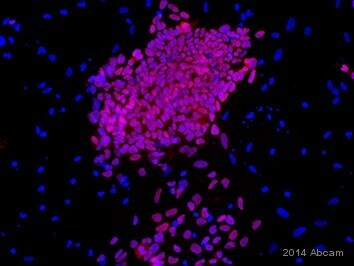 ab50839 at a 1/5 dilution staining HOXC9 in Hela cells using Alexa Fluor® 488 Goat Anti-mouse IgG at a 1/200 dilution. Publishing research using ab50839? Please let us know so that we can cite the reference in this datasheet.